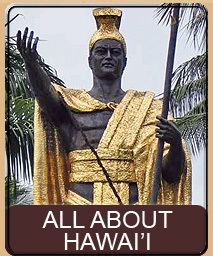 So you have finally arrived on the Big Island after a long 12+ hour flight and you're anxious to find the red hot lava you have heard so much about. You eagerly drive up to Hawai'i Volcanoes National Park and take the Chain of Craters Road down to where the road dead ends at sea level... leap out of your car fully equipped for a lava hike and are greeted by miles and miles of cold lava. How do you find the hot stuff? Finding hot lava can be divided into two basic categories... finding hot lava during the day, and finding hot lava at night. 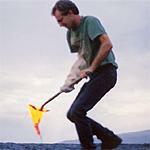 Both daytime and nighttime viewing of lava can be spectacular - but both require different techniques for locating the hot stuff. Regardless of what time you're going, the first thing you have to do is get a basic idea as to where the lava currently is flowing. 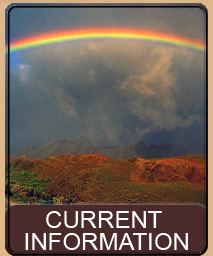 The best way to do this is to visit our Current Volcano Activity Page. The activity page comes daily from the Volcano Observatory in the park and lets you know the current location of the lava flows. In order to view lava without an extreme hike, the lava must be flowing either down the pali (hill), or have surface breakouts on the flats between the pali and ocean, or have lava flowing into the ocean (or any combination of the above three). If none of those conditions are current, you cannot see lava without an extreme and dangerous hike up the pali and towards the Pu'u 'O'o vent. Most of the time lava is visible without an extreme hike - however, there is a 3 mile by 6 mile area where it can be flowing. 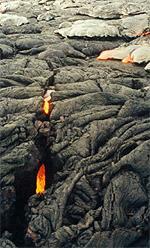 In 2000 to 2002 the lava was flowing outside of the park boundaries - much closer to the Kalapana area in lower Puna. To hike in from the park would have meant a 5 to 6 mile hike, but you could easily drive in from the Kalapana side and literally park within a few feet of flowing lava. Since 2002 through the late 2000s the flow had swung the other direction and actually covered more road inside the park. As of 2010 and continuting to today (Apr 27, 2013), it is again accessable from the Kalapana side. It is now fairly easy to drive to the end, hike a mile or two and be at the flow. So the first thing you need to do is use the volcano update to figure out if you are entering from the park side, or the Kalapana side, and then the location (pali, flats, ocean entry) of the lava. To find the hot stuff during the day, without having to wander in confusion, you use a variety of techniques in combination. First rule for finding lava... other than ocean entry, if you see smoke, there probably isn't lava there - so don't head for the smoke. Except for when lava enters the ocean, a surface flow of lava does not produce any smoke because nothing is burning (the liquid rock is already liquid). If you see smoke on the flats or on the pali it is either vegetation burning (in which case you don't want to get anywhere near it due to the risk of methane explosions) or it is steam escaping hot (but not liquid) ground. Lava doesn't smoke. If there is currently an ocean entry it will be very evident by the huge steam plume somewhere along the cliff/ocean. Head for the steam plume and you will find ocean entry. Ocean entry is usually better at night because the steam plume often obscures the lava during the day, but at night the lava illuminates the steam plume. If there is lava flowing down the pali at the back of the flats, you can usually spot the lava visually from where you park. Lava flowing down the pali means that there maybe lava near the base of the pali and perhaps even on the flats - you can head towards the pali trying to intersect the red lava a bit prematurely to see if surface flows are on the flats. The hardest lava to spot is surface flows on the flats. Because the lava field contains many tumulus (covered lava tubes that resemble small hills) you are walking up and down 20 to 40 foot rises as you try to find lava. This means that there are really no good areas where you can see for a decent distance. Look for where other people are. A group of people standing indicates they are looking and photographing something. Head for the people. If you see people walking out of the flow, ask them if they found red flow and where they found it. Watch for helicopter tours. The helicopters come over the top of the pali and will circle any flow so that all the passengers can get a good view out both sides. Note where the helicopters circle and head for those areas. Climb to the top of the tumulus (small hills) to get a better view - often you can see a bright red breakout of lava in the distance - once you spot one, head for it. Look for heat waves that are more turbulent and evident than the heat waves coming off of the cold lava around you. Heat waves are the primary method to use as you near lava to find the hottest and most active spots. Once you get to a flow do not depend on the other people in the area for finding the best flow, depend on the heat waves. Once you find surface flows you can skirt the flow to find various breakouts. Unless the surface flow is also reaching the ocean, you should be able to find the most active front and even walk around to the other side of the flow. 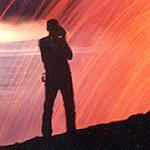 Viewing flowing lava at night can be more spectacular than during the day because of the vivid colors. During the day you don't necessarily notice that cracks in the rocks are glowing red, and that some of the ground is glowing red, and the flowing lava itself is much more vivid and colorful at night. 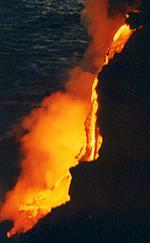 If the lava is on the pali or at the ocean entry it will be very evident at night. Any pali flow will be visible as a bright red river of lava coming down the hill. 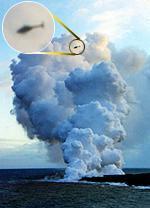 Any ocean entry will be visible as the steam plume is lit by the intense light of the lava. Finding surface flows at night requires a different technique than during the day. At night there are no helicopters, and locating other people (if any) at the flow is harder. First, as with daytime surface flows, if you do see any people hiking out, ask questions. Also look for flashlights in the distance that appear to be stationary as well as the flash of cameras. Camera flash is a good indication that something is happening in that area. As you approach a flow at night it will become more evident as you will see a bit of the glow. Climb the tumulus around you to get the best distance view and look for glowing red. The brighter the glow the more active the flow. If there are clouds, use the clouds to find the flow. The clouds will reflect the glow - but do not be confused with any glowing cloud that is over (and behind) the pali as that is the glow from the Pu'u 'O'o vent itself. If there is a brief rain shower, look for steaming glow. 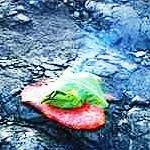 Once rain hits lava the lava will steam for a bit and the steam will be brightly lit red. Avoid standing in any steam, as it will be superheated by the lava. If the volcano activity report indicates that skylights are on the pali or flats, get a general idea of where they are from the report and head out towards that area. If the report does not mention skylights, don't waste time trying to find any - there are none. Finding a skylight during the day is pretty difficult and involves heading in the general direction and then when you think you are near the skylight starting to zigzag around the area. The more people there are in your party, the more you should split up and zigzag the area. Keep your eye level with the horizon and look for heat waves. A skylight emits a heat plume that is very evident. The heat plume will be rocketing out of the ground and is vastly different that the heat wave over a surface breakout or the normal shimmering heat wave of the regular lava. Head for the heat wave and you should find the skylight. Finding a skylight at night is much easier. 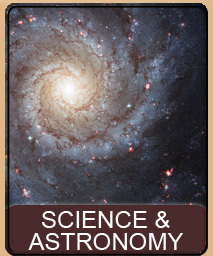 The skylight should be emitting a very evident red glow once you are in the general area. If there are any clouds it will be even more evident as the intense river of lava illuminates the cloud through the skylight opening. 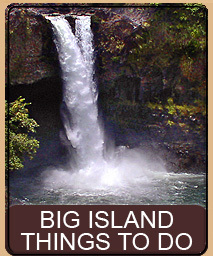 If you have the extra money to spend we highly recommend the helicopter tours that you can book out of the Kailua-Kona and Hilo airports. The lowest price is around $100 per person but the tours are well worth the price. The helicopters fly you out to the actual Pu'u 'O'o vent and allow you to peer down into the vent, then they take you all the way down to the ocean and show you the flows. 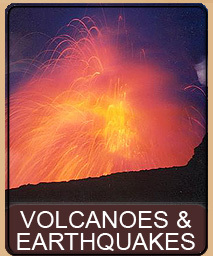 This is a fantastic way to see and learn more about the volcano, as well as allowing you to scout out where the lava is. Return as soon as you can to the lava and hike out to where you saw the flows. Several tour-guide based businesses have sprung up offering tours to the flow. The average price is around $100 per person. Taking the tour can help guarantee finding the hot lava as well as make the experience safer. 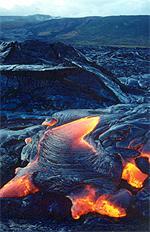 One tour we recommend is David Ewing's Lava Hikes. Several boat businesses are also offering tours. Whether a tour by boat is worth it depends on whether or not there is ocean entry, and how calm the ocean is. The ocean near the lava flow is normally fairly rough, and taking a boat tour with no ocean entry would not be worth it. 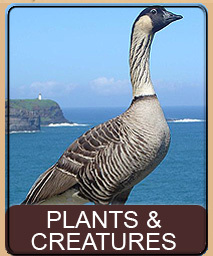 However, a boat tour with a great ocean entry can give a very different perspective then seeing it from the ground. Getting back to your car, whether daytime or nighttime is fairly easy. Since the lava flows on the flats are between the 1,500 ft pali and the ocean, all you have to do is angle back out the way you came. The road comes close to the ocean so you will either intersect the road or you will reach the ocean and can follow it to the road. If you came in from the National Park side, at night the park usually has a flashing light near the end of the road or the parking area that can help you zone in. If you came in from the Kalapana side, there are now houses at the end of the road that have lights, making finding the way back pretty easy. If, for any reason you are caught out at night without flashlights - it is possible to walk out if you have a cloudless night and a full moon. However, anything short of that our recommendation is just find a comfortable spot away from active lava and hunker down for the evening until you have enough daylight to safely walk out. In darkness, falling into an open cold lava tube and causing serious injury or death would be all too easy. Finding hot lava will probably be easier than you think. During the day and early evening hours there will be other people in the area. Don't be afraid to ask people if and where they saw lava. Most of the people out on the lava will be very friendly. As mentioned at the top of the page, you need to read the page on Cautions and Warnings, the lava can be fun, but it can also be dangerous. Be prepared, be aware and be safe. This page is named 'Volcano.lava'. Can't Find It?